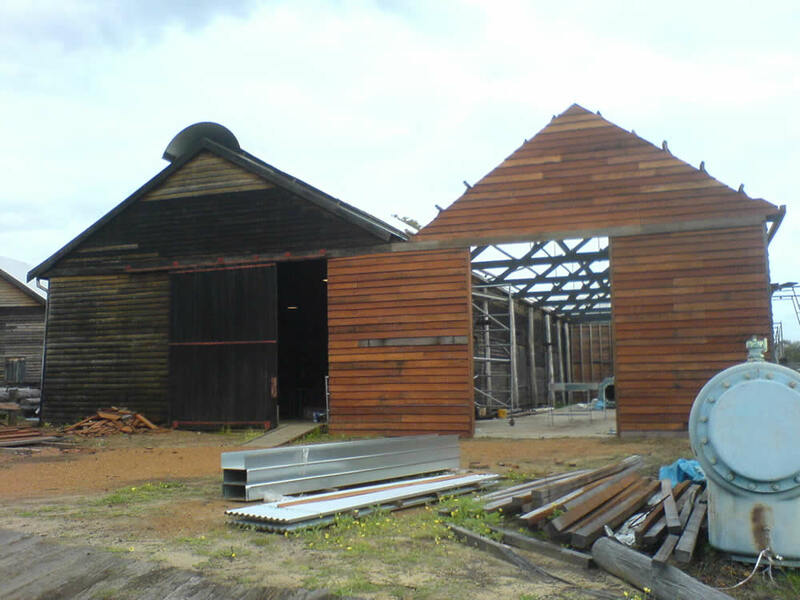 In May 2008 Yarloop Workshops formed a maintenance partnership with Fairbridge Farm to allow skilled heritage restoration workers to carry our work on our site. Fairbridge Farm trained them under their Indigenous Apprenticeship Training Scheme. The first job undertaken by them, the replacement of a long valley gutter and downpipes has been completed. Harvey Shire have agreed to allow our planned major maintenance programme for 2008/9 which will allow us to seek matching funding for major maintenance projects such as drainage. The Conservation Plan for the Yarloop Workshops has been completed by Palassis Architects. A priority will be the restoration of Caldwell’s Cottage. (the caretakers cottage). Ingersoll Rand Compressor commenced assembly. Crankcases aligned and 14.2 Ton flywheel installed May 2007. Steam Shed extension with ALCOA Funding due for completion November 2007 (see photo). Truck shop reopened to the public. Railway loop completed with installation of points. Work has commenced on Rail Safety Accreditation to allow our Steam Tram to run in the complex. Pump shed weatherboards replaced and re-roofed. Replaced window sashes Caretaker Cottage. Redevelopment stage one plans. Building work commenced to join the Souvenir Shop and Cabin Restaurant Buildings with funding from Southwest Development Commission. Work commenced on future alfresco area with new ramps and drainage well finished. Emergency Repairs funding received from Lotteries West. Funding applied for Professor David Dolan’s Interpretation Plan. Stage two completed of Doctors House restoration with funding from The State Government Pinjarra/Brunswick Sustainability Fund. the awning over the Mill Store railway platform. The Report states that, "the Yarloop Workshops are perfectly placed to be the northern gateway to the South West Industrial Heritage Trail." Furthermore: "This complex..... represents a unique example of a complete timber milling workshop in Western Australia (and possibly Australia)."